Team Intimidation sponsored fighter Brian “The Predator” Rogers is featured in a new video to promote RYSE: Son of Rome, an upcoming video game that will be released for Xbox One later this month. With the gameplay based on a Roman gladiator, the game has drawn much comparison to modern day mixed martial arts fighters as gladiators. The developers of the game have been a major sponsor for Spike TV’s Bellator MMA, where Rogers is a contracted middleweight fighter. In the video, Rogers discusses his fighting career, including his flying knee knockout over Vitor Vianna at Bellator 61, which has been named the best knockout in Bellator history multiple times. Intimidation Clothing is pleased to announce that it will sponsor in part an upcoming seminar that will be put on by Team Intimidation athlete Brian Rogers and UFC heavyweight Stipe Miocic in Toronto. The striking and wrestling for MMA seminar takes place at Evolution Martial Arts Fitness Academy on October 5th, and is presented by Badboy Clothing. Rogers, who has often been called one of the best future coaches in MMA, is one of the most recognizable members of Team Intimidation. A two-time Bellator tournament semifinalist, his flying knee knockout over Vitor Vianna at Bellator 61 has been named the best knockout in Bellator history multiple times. Along with the seminar, Rogers will also have his newest Intimidation signature shirt on sale during the autograph session. One of the UFC’s best prospects, Miocic has been sponsored by Intimidation multiple times in the past and is one of the many UFC fighters who are Intimidation alums, including Jessica Eye, Roger Bowling, Daron Cruickshank and more. The former collegiate baseball player at Cleveland State is 4-1 in his UFC career, including wins over Roy Nelson, Shane del Rosario, and Joey Beltran. Intimidation Clothing was featured on national TV multiple times over the weekend, including Spike TV, AXS TV and online at gfl.tv. First up, UFC/Bellator veteran and Colosseum Combat welterweight champion Ryan “The Tank Engine” Thomas (17-7) won his fifth straight fight as he submitted Rocky France with a triangle choke on the main card of XFC 25 on AXS TV. Thomas has finished all 5 of his consecutive wins, with four submissions and one TKO, and is now 3-0 under the XFC banner. Thomas (pictured, right) wore Intimidation’s new “Support Local MMA” tee during his walkout for this high-profile televised event. Intimidation was also featured on Spike TV on Saturday night during Bellator 98, as longtime Team Intimidation member Brian “The Professional Predator” Rogers (10-6) unfortunately came up short in his Season 9 Middleweight Tournament quarterfinal bout against Mikkel Parlo. Intimidation’s most visible brand ambassador, Rogers is regularly seen on Bellator MMA promos after scoring the promotion’s #1 knockout at Bellator 61 and is a regular at Bellator’s public events. His walkout tee was Intimidation’s latest addition – the newest version of the Brian Rogers signature tee. Also featured at Bellator 98 were two fighters who have previously been sponsored by Intimidation, as Jason Butcher (7-0) moved on in the tournament draw with a TKO over Giva Santana, while middleweight champion Alexander Shlemenko (48-7) successfully defended his title in a 5-round slugfest against challenger Brett Cooper. Butcher has been sponsored by Intimidation many times in the past dating back to his amateur career while Shlemenko was sponsored at Bellator 50 by the Intimidation brand. At Warriors Cub XVIII in New Jersey, Intimidation sponsored Muay Thai fighter Marcus Fisher put on a “body kick war” against Cyrus Washington in the co-main event, but ultimately came up short when Washington was awarded the unanimous decision. The bout was for the WBC Muay Thai Super Middleweight US National Title. Intimidation Clothing sponsored Brian Rogers has once again been honored for having the best knockout in Bellator MMA history. Rogers’ Bellator 61 flying knee knockout over Vitor Vianna was named as the top knockout in the promotion’s history. The honors were given out during a one-hour special of Bellator 360 featuring a list of the top 20 knockouts, as voted on by fans, that recently aired on Spike TV following the latest episode of Fight Master. 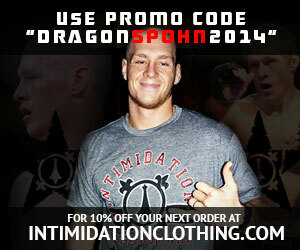 A longtime sponsored fighter, Rogers also has his own Intimidation Clothing signature t-shirt. The former special education teacher is now a full-time fighter, and he made headlines when he had a fundraising drive to raise money for his former school prior to his last fight. He also continues to give back to the education community as a public speaker and more. Video of the knockout from Bellator 61 can be found HERE.